We have a complete set of dust-free purification Die Cut Tape, which can meet the requirements of cutting, slitting and pasting raw materials into various processes, high precision and high quality for precision adhesive die cut tape. 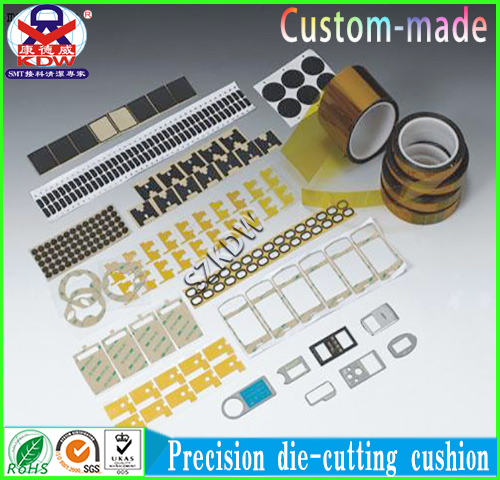 Precision die cutting products: kapton, die cutting of shielding materials, precision die cutting products of various brands of double-sided adhesive tapes, foam, protective films, gauze, insulating gaskets, metal gaskets and special electronic materials. ▲ adhesive products: various special rubber pads and stickers for electronic, electrical and mobile phones; 3m, Sony, tesa, nitto and other imported brand adhesive tapes. 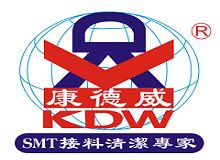 Adhesive products such as Kapton Polyimide Tape, pet adhesive tape, double-sided adhesive tape, teflon adhesive tape, high-temperature mei Wen adhesive tape, acetate cloth adhesive tape, glass cloth adhesive tape, PE foam double-sided adhesive tape, acrylic acrylic double-sided adhesive tape, etc. ▲ anti - shock, cushioning and anti-skid products: rubber sheet, silica gel sheet, EVA, polyurethane, EPDM, poron, electronic PE, etc. ▲ conductive and shielding products: conductive cloth, conductive foam, copper foil, aluminum foil, conductive adhesive paper, etc. ▲ insulation, pressure resistance and heat conduction products: rubber sheet, silica gel sheet, fireproof fast-bar paper, pet, PVC, PC, mica sheet, etc. ▲ anti-static products: anti-static PVC, sponge, adhesive tape and other anti-static series. Sponge products: various densities of sponge. Looking for ideal Kapton Tape Die-Cut Tape Manufacturer & supplier ? We have a wide selection at great prices to help you get creative. 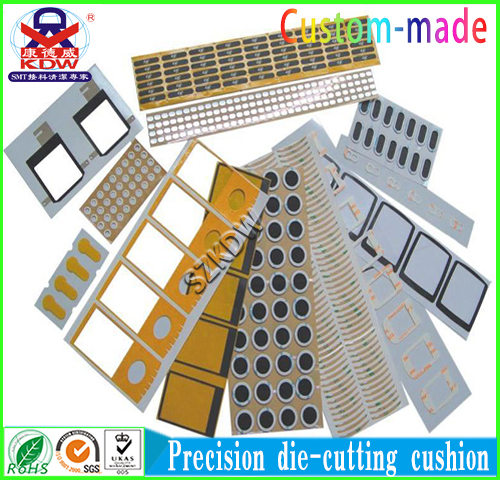 All the High Temperature Die Cutting Products are quality guaranteed. We are China Origin Factory of Foam Die-Cut Tape. If you have any question, please feel free to contact us.